Intuit recently released an eye-opening new survey reporting that there are currently 3.2 million American workers who participate in the on-demand economy. By 2020, it’s estimated that there will be almost 8 million of these on-demand workers. 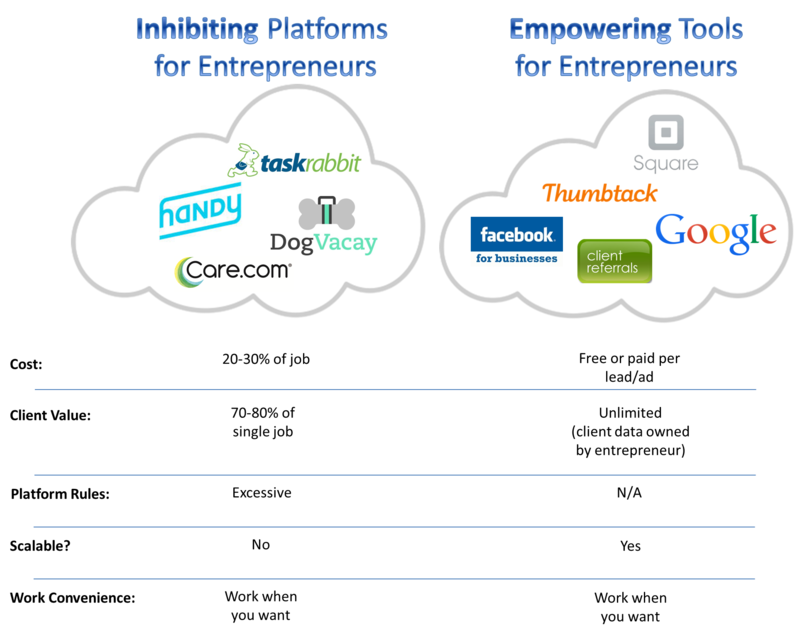 Many (including Intuit) praise this on-demand movement as supporting a “new class of entrepreneur,” giving workers the tools they need to build their own businesses to work when they want and how often they want. A New Class Of Entrepreneur? A true “entrepreneur” is defined as a professional who takes on greater than normal financial risk to build a business for greater reward. Entrepreneurship is not simply defined by flexible work hours. An entrepreneur is someone who takes risks so that he or she can work to build a business offering goods or services, all the while maintaining and growing customer relationships, employing staff members and much more. There is no ceiling or limit to an entrepreneur’s potential, as the efforts and risks associated with starting a business are extremely high. The platforms that have fueled this on-demand economy have caused debate around whether they are actually empowering or enslaving members of today’s workforce. For service-based professionals, platforms like Uber, Handy, TaskRabbit, DogVacay and others offer quick ways for professionals to get new business and generate new sources of income. However, if you’re one of the millions of local home service professionals (e.g., cleaners, plumbers, dog walkers, etc.) looking to truly build a business, this on-demand world might not be the place for you. As an eager “entrepreneur,” the steps to realistically building a service business within the confines of this on-demand structure are more inhibiting than inviting. To build toward a scalable service business, Pros needs to be working at 100 percent capacity in order to warrant bringing on more workers to grow a real business. Pros need to first get listed on as many relevant platforms as possible to maximize their utilization. On some of these platforms there are maximum (and minimum) amount of hours a Pro has to work each week, forcing Pros to spread certain windows of their availability across platforms and shift platforms depending on the amount of business they bring in each week. Service-based entrepreneurs are truly empowered by lead-gen and marketing platforms. Business owners need to accept the fact that these on-demand companies control all their customer data, analyze and determine what jobs get delivered to them and can suddenly shut down (e.g., HomeJoy), completely eliminating that platform as a new business pipeline. Managing these new risks and systems is a must when trying to grow efficiently within the platform ecosystem. Besides abiding by common federal and state laws as a business owner, Pros are required to consent to another layer of Big Brother oversight when structuring a business built upon these on-demand platforms. Similar to an employee working at a company, there are strict regulations and guidelines that a Pro must follow in order to reduce the risk of getting “fired” from said platform. Each platform also has its own proprietary review and feedback portal, which business owners need to monitor as those customer-experience ratings will determine the type, quality and frequency of client jobs. Finally, platforms strictly forbid Pros from taking clients “offline” — the motivation for which is to avoid the hefty platform fees going forward and to hopefully build a direct relationship with a client. These on-demand platforms control the client’s contact information, payment information, transaction history and profile detail — the only thing the Pro can do is show up for work, perform the job, stay within the guidelines and move on. Assuming the Pro has a regular stream of work across platforms, has high ratings and has remained in compliance with all work guidelines, the Pro is ready to expand his or her business and hire additional workers to take on any excess demand. The issue here is making the economics work when hiring staff. Typically, the way service businesses work is the subcontractors (or employees) make 70-80 percent of each job, with the remaining 20-30 percent going to the business owner for facilitating the work. But because there is already a platform taking ~25 percent of each job, by the time the business owner takes his or her fee (i.e., the economics necessary to build a service business), the worker is left with only 50 percent on each job. These economics don’t make sense. The worker will simply end up going straight to the platform directly, cutting the Pro out of the equation, to make 75 percent on each job. The on-demand platform has essentially replaced the role of the entrepreneur, encouraging any worker to choose the “platform as boss” model. The truth is, abiding by the current on-demand framework makes building a successful home services business impossible. Many of these on-demand service platforms simply take the form of a home cleaning company or handyman franchise or pet sitting agency, with more streamlined technology around marketing and staffing (not to mention billions in venture capital). In all the aforementioned cases, workers get paid their 70-80 percent cut, company or platform rules must be followed and penalties are doled out if workers attempt to pull clients away from the company or platform. Entrepreneurship is not simply defined by flexible work hours. But the more salient effect these on-demand platforms are having on our labor force is encouraging part-time work as opposed to full-time work. It’s more economical for these platforms to have millions of laborers working very few hours at a low price per hour with limited rights, than thousands of laborers working more hours asking for profit-squeezing benefits. The Great Recession was the initial spark that drove part-time employment as a percent of total employment to its highest percentage ever. Part-time employment contribution has indeed drifted from its highs as the overall economy has recovered, but there appears to be a “new normal” as the U.S. is six years out of its recessionary trough. 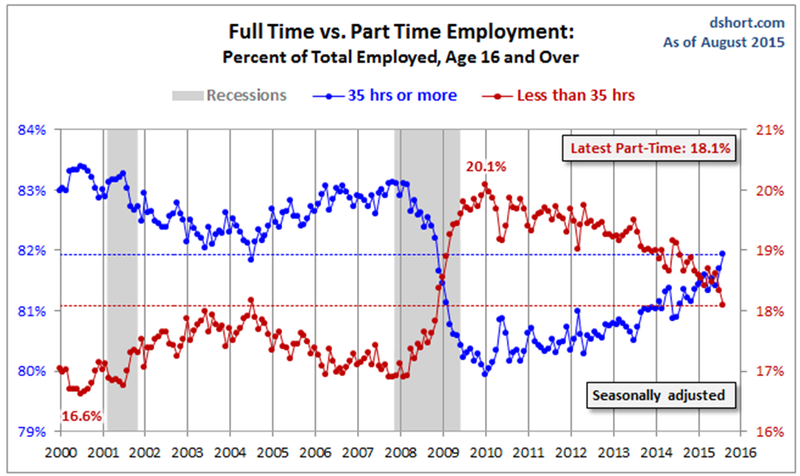 However, part-time employment levels are still well above historical trends. Clearly, there is a lot of work ahead as it relates to workforce re-classification — employee versus independent contractor versus something more in the middle (i.e., “dependent contractor”) — and the associated rights that go along with the appropriate classification (i.e., severance, healthcare, paid leave, etc.). Some have even suggested a Shared Security System giving on-demand workers pro rata employee benefits and rights based on their part-time hours worked. However, as it relates to fostering a new entrepreneurial movement, these on-demand platforms are not empowering a “new class of entrepreneur” to build great home service enterprises — they are simply fueling a new class of worker. Service-based entrepreneurs are truly empowered by lead-gen and marketing platforms like Facebook, Thumbtack, Yelp, Google and others, enabling any aspiring entrepreneur to build a business presence and access affordable marketing techniques without heavy third-party platform restrictions. Entrepreneurs are also empowered by mobile business tools to help better manage their own client data, schedule customers and efficiently collect and track payment (e.g., Square, PayPal, etc. ), supporting them as they efficiently scale their businesses on their own terms. On-demand platforms are simply exploiting the “casual workforce” with the draw of quick income and flexible work schedules. By limiting the Pro’s access to benefits, client data and upward mobility, the on-demand economy is simply carving out a new class of worker, while ensuring a glass ceiling is holding firm, preventing service-based entrepreneurs from breaking through.